Home BP Monitoring – Get it right? When your heart pumps, it does so to move the blood across the body in order to deliver oxygen and energy to all tissues which need them. Like water running through a hose, the blood exerts some pressure on the walls of the arteries which carry it. The strength of this pressure is called Blood Pressure. What is High BP (Hypertension)? If your BP readings are consistently over 140/90 on several measurements taken across 2-3 weeks, then you have high BP. This is true even if one of the two numbers is consistently high across several weeks. Ideally BP should be below 120/80. If your BP is between 120/80 and 140/90, you have Prehypertension and should take steps to lower it or prevent it from rising further. Why should I monitor BP at home? High BP puts extra strain on heart and arteries and if uncorrected over time can cause heart problems, stroke, and kidney problems. However since hypertension does not have any signs or symptoms, the only way to know if you have high BP is to monitor your BP regularly. This is especially true if you have higher risk for hypertension based on family history, lifestyle, or age. Which BP monitor should I choose for home monitoring? The most convenient monitors for home BP measurement are the fully automated digital BP meters. They are easy to use and fairly accurate. Just make sure you buy it from a trusted source. We recommend a monitor that records BP in the upper arm rather than the wrist or finger, because these monitors often give the most accurate or consistent results. For arm BP monitors, cuff size is very important. Most monitors come with a medium sized cuff which is suitable for an arm size (circumference of the arm taken at the midpoint between shoulder and elbow) of 8.5 to 12.8 inches. If your arm size is less than 8.5”, choose a small cuff size and if its over 12.8”, choose a large cuff. BP monitors can vary in price. This usually depends on the number of extra features like built-in memory, for example. All you need to measure your blood pressure correctly is an accurate monitor, and a pen and paper to record your readings. Extra features can be helpful but they are not necessary. 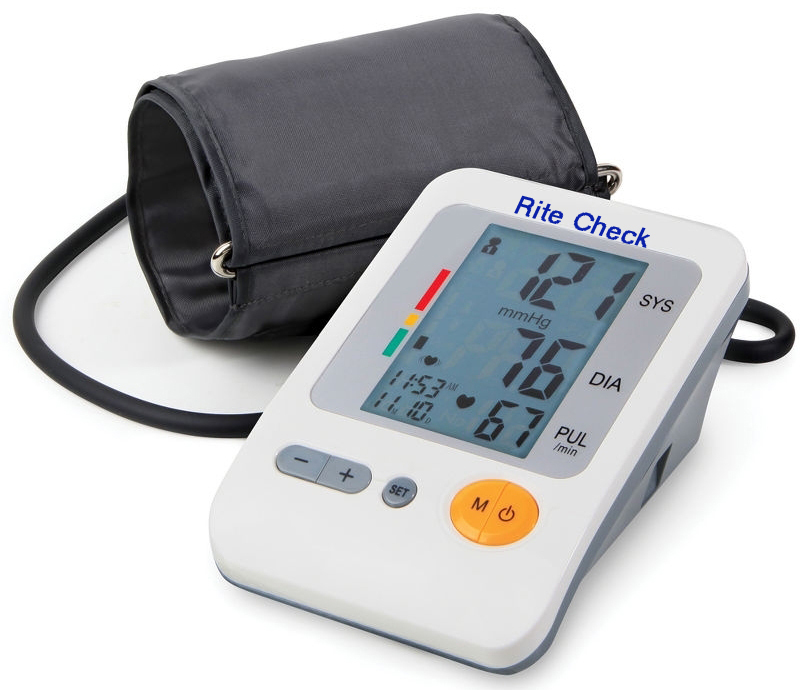 Choose a home blood pressure monitor that you can afford. How to record BP using a home blood pressure monitor? Many things can make your BP rise for a short time like activity, emotion, food etc. Make sure you are relaxed and comfortable, you don’t need to use the toilet, and that you have not just eaten a meal. Do not measure your blood pressure within 30 minutes of drinking caffeine, alcohol or smoking. Wear loose-fitting clothes with short or no sleeves so that you can push your sleeve up comfortably. Always use the same arm for readings, as each arm will give you a slightly different reading. 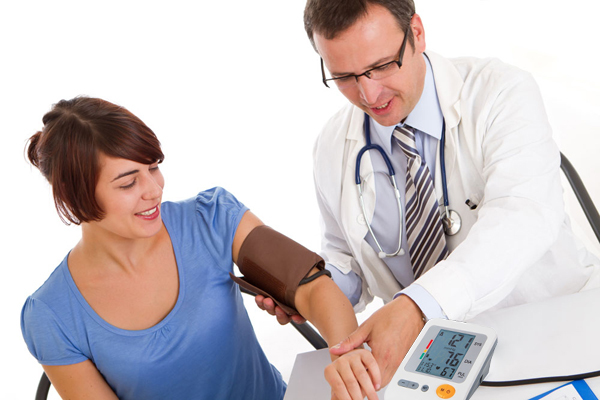 If possible, use the arm that your doctor or nurse uses when measuring your blood pressure. Put the cuff on as per the instructions on the box that came with your monitor. Before you take your reading, rest for a couple of minutes. You should be sitting down in a quiet place, preferably at a desk or table, with your arm resting on a firm surface and your feet flat on the floor. Make sure your arm is supported and that the cuff around your arm is at the same level as your heart. If required, support your arm with a cushion to be sure it is at the correct height. Your arm should be relaxed, not tensed. When you are taking your reading, keep still and silent. Moving and talking can affect your reading. Take two or three readings, each about two minutes apart, and then work out the average. Some people find that their first reading is much higher than the next readings. If this is true for you, keep taking readings until they level out and stop falling, then use this as your reading. How often should I check my BP? When and how often you check will depend on your blood pressure. If you have never been diagnosed to have high BP, you can monitor occasionally if you are under 40 yrs of age and more frequently, perhaps every 3 months, thereafter. Measure your blood pressure morning and evening for 2-3 days to have a clear picture of what your blood pressure is like normally. If you have high BP and have started treatment, measure the BP at home day and night for a week initially, to get an idea of what the BP is like normally and periodically thereafter like once every two weeks. If you are given a new medicine or a higher dose of medicine, then you should measure your blood pressure over a few weeks to see if it is having the desired effect. You should ideally record home BP readings at around the same time each day to have a consistent picture, perhaps like first thing in the morning and at night before you go to bed.